Hartmann, T., Jílková, J., Schanze, J.: Land for flood risk management: A catchment‐wide and cross‐disciplinary perspective. DOI: 10.1111/jfr3.12344 (available here). Bornschein, A., Pohl, R.: Land use influence on flood routing and retention from the viewpoint of hydromechanics. DOI: 10.1111/jfr3.12289 (available here). Jüpner, R.: Coping with extremes – experiences from event management during the recent Elbe flood disaster in 2013. DOI: 10.1111/jfr3.12286 (available here). Pant, R., Thacker, S., Hall, J.W., Alderson, D., Barr, S.: Critical infrastructure impact assessment due to flood exposure. DOI: 10.1111/jfr3.12288 (available here). Milman, A., Warner, B.P., Chapman, D.A., Short Gianotti, A.G.: Identifying and quantifying landowner perspectives on integrated flood risk management. DOI: 10.1111/jfr3.12291 (available here). Tarlock, D., Albrecht, J.: Potential constitutional constraints on the regulation of flood plain development: three case studies. DOI: 10.1111/jfr3.12274 (available here). Seher, W., Löschner, L.: Balancing upstream–downstream interests in flood risk management: experiences from a catchment‐based approach in Austria. DOI: 10.1111/jfr3.12266 (available here). Machac, J., Hartmann, T., Jilkova, J.: Negotiating land for flood risk management : upstream‐downstream in the light of economic game theory. DOI: 10.1111/jfr3.12317 (available here). Collentine, D.,Futter, M.N. 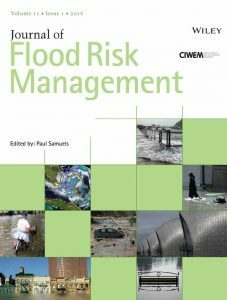 : Realising the potential of natural water retention measures in catchment flood management: trade‐offs and matching interests. DOI: 10.1111/jfr3.12269 (available here). McCarthy, S., Viavattene, C., Sheehan, J., Green, C.: Compensatory approaches and engagement techniques to gain flood storage in England and Wales. DOI: 10.1111/jfr3.12336 (available here). Slavikova, L.: Effects of government flood expenditures: the problem of crowding‐out. DOI: 10.1111/jfr3.12265 (available here).